Incipit/explicit: Calvaire et vous leur deites filles.../...paradis avec moy. Sire si comme... Text is from the Seven Requests of Our Lord, 4-6. Illumination on this fragment consists of a gold rinceaux and floral motif along with a gilded border on the edge of the text closest to the page edge. 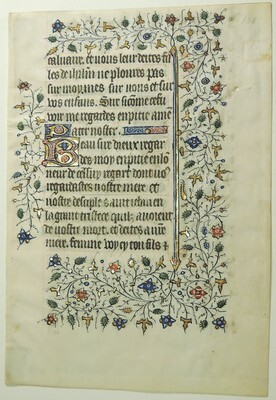 First letter of each request and "Pater noster" are also illuminated.